Bobby Matos and his Afro Latin Jazz Ensemble are usually at home on the performance stage, but the group's founder left his comfort zone to lead a protest against The Recording Academy, for eliminating select Grammy categories. 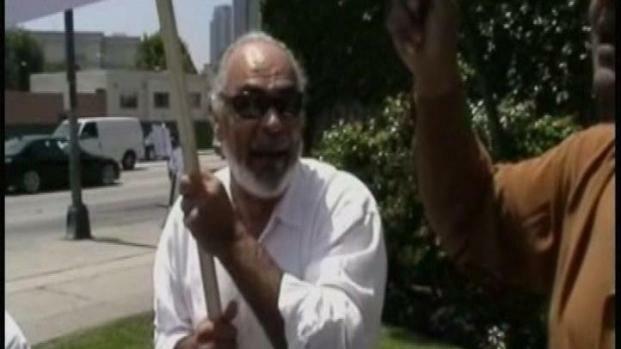 Protesters gathered at Beverly Hills to call the cuts are a slap at music diversity. "Latin Jazz was the one that concerns me quite a bit, but also contemporary jazz, which would mean people like Herbie Hancock, and Wayne Shorter. Many of the Gospel categories, some of the mainstream blues catagories. Hawaiian music, zydeco music," states to Bobby Matos, Jazz Artist. Recording industry heavy hitters walked The Staples Center red carpet last February at The 53rd Annual Grammys. Lady Gaga turned heads for arriving in an egg carried by attendants. Cuts of 30 Grammy Award categories, most involving ethnic music, sparked protests Thursday at the National Academy of Recording Arts and Sciences. Carlos Santana and Paul Simon are also voicing opposition to the change. Then, one month later, the Grammy parent group NARAS, The National Academy for Recording Arts and Sciences, cut Grammy fields from 109 to 78. Former Tonight Show bandleader Kevin Eubanks questions the reduction. "They have to resolve that, because that will be something that will not be tolerated. I cannot believe that these categories are gonna be cut, in a way that would look like they're unimportant," according to Kevin Eubanks, Jazz Guitarist. But in a statement NARAS President Neil Portnow said, "After careful and extensive review and analysis of all categories and fields, it was objectively determined that our Grammy categories be restructured to the continued competition and prestige of the highest and only peer-recognized award in music." But veteran artists say, that explanation rings hollow. "They are peer group awards, they're not write in popularity votes, like American Idol, and they should be treated as such," says Matos.